Neighbouring air ambulances worked together at the accident on the M1 near Catthorpe yesterday. Both the Warwickshire & Northamptonshire Air Ambulance and the Derbyshire, Leicestershire & Rutland Air Ambulance were called to the scene after four lorries and a car collided. The air ambulances were activated within minutes of each other, and both were in the air by 3.40pm, with WNAA arriving on-scene at 3.55pm and DLRAA at 3.59pm. 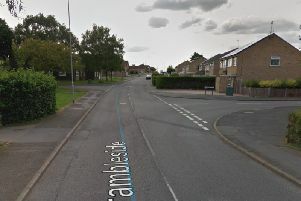 The paramedics worked with the other emergency services on-scene, including East Midlands Ambulance Service, to assess and treat a woman and a man in their 30s. The woman, who had been driving the car, had suffered a head injury, and was sedated before being flown to University Hospitals Coventry and Warwickshire. The second patient, who had been a passenger in the car, suffered chest and pelvic injuries, and was given pain relief and immobilised for flight. He was also taken to University Hospitals Coventry and Warwickshire. The current condition of the patients is unknown.